Introduction - Has There Ever Been an Official Church Flag for LDS? Introduction: Has There Ever Been an Official Church Flag for LDS? The Mormon Church (a nickname) is properly called the "Church of Jesus Christ of Latter-day Saints," but also popularly called the "LDS" and the "LDS Church." Members of the Church of Jesus Christ of Latter-day Saints are commonly called Mormons or Latter-day Saints. Descriptive terms such as the Mormon Train and Mormon Pioneers are historical and appropriate when used in that context. It is important to recognize that there is no official church sanctioned flag for the Church of Jesus Christ of Latter-day Saints, nor has there really ever been one, but because there was little separation of church and state in early Utah history, flags used by the Mormon Pioneers have sometimes become called church flags, which they were not. It is the difference of saying a flag was THE flag of the Mormon Church, rather than simply a flag used by Mormons. Studying the historic flags of Utah can be very complicated because up until Brigham Young's death, Utah was a theocracy (ruled by the church leaders), and had little separation between church and state. To add to the confusion, many of the early flags had similar and related designs, and early flag documentation was sparse, incomplete, and could lead to multiple interpretations, further muddying the waters. Using the term "flag of the Mormons" could have multiple meanings. From the first arrival of the Mormon Pioneers in 1847, through the Provisional State of Deseret and the Utah Territory, and up until Utah's Statehood in 1896, there were many variations of flags having stars and stripes displayed. Each of these flags was unique, hand-made, and different from one another. Many had red and white stripes; some blue and white stripes, and some even had red, white, and blue stripes. The unions were usually blue with white stars, but occasionally white with blue stars or even white with red stars. Unfortunately for the flag scholar, exact colors were rarely mentioned, and most surviving images were, of course, only in black and white. Written descriptions were vague to the point of calling them simply the Mormon flag, the stars and stripes, the flag, or the Deseret flag. No single flag had a standard pattern, and more importantly, none of these flags were meant to represent the LDS church itself. By 1877 it was already firmly but falsely believed that Brigham Young had raised a flag on Ensign Peak on his first visit there on July 26, 1847. There is no actual evidence he did, or what flag he might have used if he did. Some maintained it was merely a US flag, but others insisted it was a special religious flag called the "Ensign of the Nations." As time passed other candidates for the honor of being the first Ensign Peak flag were suggested: the flag of the Pueblo Detachment of the Mormon Battalion, placed there on its arrival at Salt Lake City, or a personal 13-Star Flag belonging to Brigham Young himself would be examples. But once again, none of these flags actually represented the LDS Church itself, but rather were simply flags being used by the Mormons pioneers at the time. Perhaps the most interesting story claims that at Brigham Young's death in 1877, Don Maguire, a non-Mormon mining equipment peddler from Ogden, visited Salt Lake on the day of the funeral. He saw and described a flag displayed from the second story of a home of Heber C. Kimball, one of Young's late associates. He described it as a stars and stripes with blue and white stripes, but didn't say how many stripes. He said it had a blue canton with a circle of 12 white stars surrounding a larger central 13th star. He did not describe how many stripes deep the canton was or how many points the stars displayed. Maguire went on to assert that this flag was "The Flag of Mormon Supremacy" which Young had raised on Ensign Peak in 1847. When the flag was removed from display about 2 p.m., Maguire further suggested it was folded and placed with Young's body before burial. Although, Maguire can be trusted on his description of the flag, his comments about the flag's significance and its history are doubtful. Again, there is no indication that this was an official church flag, but once again a flag used by the early Mormon pioneers. There was no standard flag used to represent the Deseret Territory (1847-1896) which was colonized by the Mormon pioneers in the mid-1800s. Many of the flags had red/white/blue or just blue/white horizontal stripes, sometimes with stars of white in the canton. This (reconstructed) flag drawing is based on a description made by an early territorial trader named Don Maguire who claimed he saw it displayed from a second story window of the home of Heber C. Kimball. Maguire was a non-Mormon who traveled to Salt Lake when Brigham Young died to make sure "the old devil was dead." It was he that made the highly speculative assertion that the flag had first been displayed on Ensign Peak, but the records do not support his claim. Historically, it seems fairly certain that no flag was even carried by the first Mormon party to visit the future home of Salt Lake City (at the time still part of Mexico), and certainly no flag was flown from Ensign Peak as legends attempt to suggest on that first visit on July 26, 1847. 11 - And now it came to pass that when Moroni, who was the chief commander of the armies of the Nephites, had heard of these dissensions, he was angry with Amalickiah. 12 - And it came to pass that he rent his coat; and he took a piece thereof, and wrote upon it - In memory of our God, our religion, and freedom, and our peace, our wives, and our children-and he fastened it upon the end of a pole. 13 - And he fastened on his head-plate, and his abreastplate, and his shields, and girded on his armor about his loins; and he took the pole, which had on the end thereof his rent coat, (and he called it the title of liberty) and he bowed himself to the earth, and he prayed mightily unto his God for the blessings of liberty to rest upon his brethren, so long as there should a band of Christians remain to possess the land. 36 - And it came to pass also, that he caused the title of liberty to be hoisted upon every tower which was in all the land, which was possessed by the Nephites; and thus Moroni planted the standard of liberty among the Nephites. 20 - And the remainder of those dissenters, rather than be smitten down to the earth by the sword, yielded to the standard of liberty, and were compelled to hoist the title of liberty upon their towers, and in their cities, and to take up arms in defence of their country. 4 - And he did raise the standard of liberty in whatsoever place he did enter, and gained whatsoever force he could in all his march towards the land of Gideon. 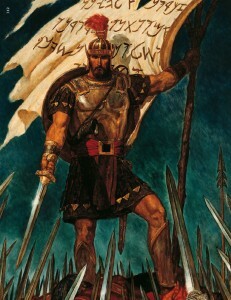 According to the Book of Mormon a standard was raised by Moroni, Chief Commander of the Nephite armies, to rally the Nephites to defend their liberties from a group of dissenters who wanted to establish their leader as a king. According to Mormon tradition Moroni made the standard, called the Title of Liberty, out of his torn coat and raised it to inspire the Nephite people to defend their religion, freedom, peace, and families. No image or complete description of the flag exists, but many speculative drawings like those above appear in Mormon literature. I have seen reproductions of this flag of historical significance. The Mormon Battalion Home Page is informative and even more information, including the above photograph was on the Ol' Buffalo Mormon Battalion Page. In 1846, the Mormon Battalion was formed at Council Bluffs in the Iowa Territory, under the authority of US Army of the West, from a large makeshift encampment of Mormon refugees. More than 500 men, 32 women, and more than 50 children from the Church of Jesus Christ of Latter-day Saints volunteered to serve in the US Army. They were enlisted to join forces with General Stephen W. Kearny and fight for the United States in the Mexican-American War. They were destined to play an important part in the early development of California. They later made bricks that were used in constructing houses throughout southern California, and built Fort Moore in Los Angeles and the Courthouse in San Diego. Many eventually settled in California after the war. This flag is believed by some to have accompanied the Mormon Battalion on its famous march to California. However, the date of 1847 shown on the flag is indication that it was made after the march. As with 1776, the year 1847 only gained symbolic meaning in the years that followed. The flag is one sided is not constructed well enough to have been carried on the march. In parades held in later years, veterans of the famous infantry march carried flags and banners like this one in patriotic parades. Even if it is a veterans' flag and not the flag of the Battalion used during the march, it is significant in that the design in the canton is likely patterned after a flag of Deseret in use when the flag was made. The drawn image supposes an additional red star in the missing upper right corner, which may not have existed or have been of different design. Source: Historical Flags of Our Ancestors. 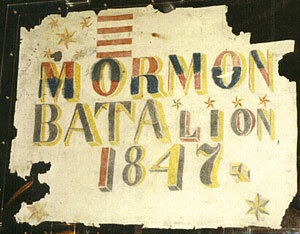 There is a reproduction of the 1855 Mormon flag at the Old Las Vegas Mormon Fort in Las Vegas, Nevada. Our Civil War Re-enactors gather and train at that location under 1860s or post war colors as the US Army passed through, and later left a detachment there post war. At the time, and now, we are uncertain if it is actually a historic American flag or a religious Flag, i.e., does a US Military Unit salute it, or simply stand at attention. There are the pictures of note in an article focused on the Mormon Missionary Reenactors. In 1855, the Mormon's built a fort in Las Vegas and raised an improvised flag of Deseret. Since there were springs in Las Vegas (The Meadows) it provided travelers on the Old Spanish Trail a resting place between Salt Lake and San Diego. Brigham Young sent William Bringhurst and thirty men to establish this way station in the Las Vegas Valley. At the time it was part of the proposed State of Deseret. A white field traversed by twelve dark blue bars, offset towards the hoist, at the center of which is a circular charge with a dark yellow sun having twelve rays. The use of the number twelve represents both the twelve Tribes of Israel, which will be restored in the last days, as well as the twelve apostles. The sun symbolizes Christ as the center of His church with His twelve apostles, both ancient and modern, as the guiding light to mankind. The sun also represents the celestial kingdom that we aspire to attain and the coming millennial rule of Christ on earth. As well, the use of the sun evokes the desert state of Utah as the central home of the Mormon religion. The circle represents the one eternal round of life, without beginning or end. The central device also suggests the image of a wagon wheel and thus reminds us of our pioneer heritage. The color white represents purity of the heart – cleanliness of thought, word, and deed. It also represents the clarity of eternal truth. The color blue represents the first gospel ordinances – Faith in Christ, Repentance, Baptism for the remission of sins and the Gift of the Holy Spirit. It also symbolizes the principles of truthfulness, chastity, benevolence, virtue, humility, sacrifice – striving to live a Christ-like life. The color yellow represents the brightness of the noon-day sun, celestial glory. Image provided by copyright owner, 27 November 2002; no reproduction or redrawing permitted. According to this flag's designer... "The LDS church created and displayed 'The Church Flag' (a.k.a. The Mormon Pioneer Flag) in the 1800s. One account of its display was during the first Utah Pioneer Day in July of 1849. The 'Church Flag' was unfurled and raised in a celebration on Ensign Peak in Salt Lake City. The flag takes its design from historical documents recorded in the mid 1800s. The flag's beginnings can be traced back to the prophet Joseph Smith Jr. One recorded account was, in preparation to defend Nauvoo from attacks by anti-Mormon mobs on June 22, 1844, Joseph Smith Jr. gave the instruction for a "standard to be made and raised to the nation". Just five days later Joseph Smith Jr. and his brother Hyrum Smith were killed by an angry, bloodthirsty mob at Carthage jail. It was Brigham Young who continued the preparation for the standard to be lifted in the mountains of Zion. It is well known in the church that while still in Nauvoo, Brigham Young had a vision of Joseph Smith Jr., who showed him the mountain which is called now Ensign Peak, in Salt Lake City, and that he saw the "colors" fall upon that peak. In that vision Joseph said to him "Build under the point where the colors fall and you will prosper and have peace". That's exactly what Brigham Young and the members of the church did after arriving in Salt Lake City. Many pioneer journals recorded Brigham Young preaching sermons in reference to a standard, or Mormon flag. As one account states, in January 13, 1846, "President Brigham Young said that the proud banner of Liberty would wave over the valleys that are within the Mountains and I know where the spot is and I know how to make this Flag. Joseph sent the colors and said where the colors settled there would be the spot". Another journal records, on May 29, 1847, that President Young said: "The standard and ensign would be reared in Zion...the standard would be a flag of every nation under heaven". Again, in 1853 it is written that Brigham Young stated that the saints had "hoisted the flag of our independence". B.H. Roberts explains the pioneers view of 'The Church Flag' as this: "The Ensign that these Latter-day Saint Pioneers had in mind, and of which they had frequently spoke en route, was something larger and greater than any national flag whatsoever, and what it was meant to represent was greater than any earthly kingdom's interest...This Ensign in the minds of the Mormon Pioneers concerned not one nation, but all nations; not one epoch or age, but all epochs and all ages; not nationality but humanity; is its scope and concern. It was a sign and ensign of the Empire of Christ; it was a prophecy of the time to come when the kingdoms of this world would become the kingdom of our Lord, and of His Christ, and He shall reign forever and forever". In September 1877, an account of The Church Flag being displayed was described by a visiting Californian: "Utah history states that the flag known as the Stars and Stripes was placed on Ensign Peak about the twenty-ninth day of July 1847. The so-called flag of the Stars and Stripes placed there on that occasion was a flag having in its upper left hand corner a...field with the circle of twelve stars and in the center a...large star. The stripes on that flag, instead of being red and white stripes, were blue and white stripes and it was to be the flag denoting Mormon sovereignty over the area that they had now taken possession of...During Brigham Young's Funeral this flag hung from a second story window of Herbert C. Kimball's residence." "The color white represents the purity of the heart; the Savior's atonement; the spotlessness of the repentant spirit (a new and pure life); cleanliness of thought; word, and deed; the radiance of great faith; the devotion of Zion; the spirit of the Lord; the gift of the Holy Ghost; the celestial kingdom; the clarity of eternal truth; the morning of the first resurrection; constancy; valiance; fidelity; eternity; wisdom; happiness; joy; peace; and God's love for His children. The central symbolism of the 13 stars is described as follows: The single large star represents the kingdom of God on earth; the gathering of the 12 tribes of Israel in preparation for the savior's second coming; the preaching of the gospel throughout the world and His gospel taught on earth and in heaven; all humanity united together before the Lord (every knee shall bow and tongue confess that Jesus is the Christ); the temples on earth (the 12 stones in the foundation; the houses of the Lord); The ordained apostles and prophets of the Lord leading His work on earth with the proper keys and priesthood authority of God. The central ideal of The Church Flag is that the Savior Jesus Christ is the Lord and King of the kingdom of God in Heaven and on Earth". This blue and white "Deseret Flag" is not a historic flag of Utah, but a 20th Century variant modeled after the earlier 19th Century flags. The designer of the flag promoted it as the "Mormon Flag of God's Kingdom," or more simply the "LDS Flag," However, although the promoter suggests that it is a church sponsored flag, it is not an official symbol for the Church of Jesus Christ of Latter-day Saints, nor is it in anyway, a church sponsored flag. The unfortunate display of this flag as one of three permanently flown on the three flag poles at the base of Ensign Peak has given it an unwarranted impression that the flag has a historical tie to Ensign Peak were none actually exist. A dome shaped outcropping of rocks that rises 1,080 feet above the valley floor, Ensign Peak is situated at the head of Main Street and dominates the sky line above the Utah State Capitol, Pioneers climbed this mount two days after their arrival to get a better view of the Salt Lake Valley. Pronouncing it a "good place to raise an ensign," they named it Ensign Peak. They carried no flag with them on that day, and most certainly the "Mormon Flag of God's Kingdom" has no historic link or association with Ensign Peak. No official church flag has ever been adopted by the LDS. See: "Mormon Flag of God's Kingdom" and "Ensign Peak Flag" for source information. On this web page, a copyright claim is made for this flag design. I have been in contact with the LDS Church Intellectual Property Office and received a response back from them indicating that the flag's design is in the public domain and therefore not copyrightable. I have also contacted the US Copyright Office in Washington DC and spoke with an attorney there who indicated that the "Stars and Stripes" and the Betsy Ross flag design were not copyrightable images.